MYSIAST NEWS – Dr. Ken Coates said, over the next decade, SIAST is “the right thing for the right time.” But he also challenged SIAST management, faculty and staff to think ahead in order to make the institution stronger as a polytechnic. THE GLOBE AND MAIL – Should Canadian universities adopt a standardized test for admissions? Click here to read an op-ed by Ken Coates in response to this question. THE GLOBE AND MAIL – Ken Coates discusses the role of polytechnic institutes in the Canadian post-secondary landscape and explains why their significance is increasing in the modern economy. CBC MARITIME NOON – Listen as Ken Coates participates in a phone-in panel on the rise in enrolment at Canadian universities. Should Canadian Universities be more Elitist? CBC RADIO – For generations, Canadians have looked at university education as a clear path to middle class prosperity. It’s held up as an egalitarian system where everyone has the chance to earn a degree. But Ken Coates says Canadian universities need to get more exclusive and cater to the intellectual elite. 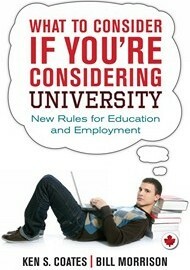 Too Many Students at Canadian Universities? CBC RADIO CALGARY – Ken Coates explains the implications of overcrowding at Canadian universities, and suggests that a shift in enrolment patterns is needed to make universities more sustainable. The Million Dollar Promise – Will you Actually Earn More With a University Degree? GLOBAL NEWS – Ken Coates examines the often cited claim that a university education will provide a higher income in the future.